The following review will focus on a Shiseido Full Lash Serum product. With this high-performance serum, the manufacturer claims that it can produce longer and thicker-looking lashes. Keep on reading to see what benefits come with the use of Shiseido Full Lash Serum and if this product is something you should try. 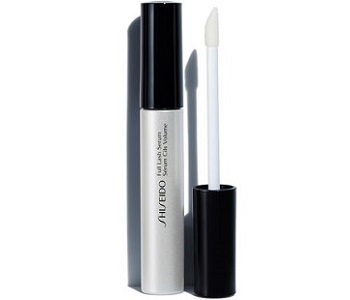 Shiseido Full Lash Serum states that the main active ingredient in this product is Arginine. They claim that this helps to restore the condition of hair, like on the lashes and brows. In addition to this, the ingredients aim to help prevent lashes and brows from looking spares, short, and thin. Unfortunately, our research shows that other brands contain at least 5 ingredients that are patented and backed by credible scientific research and clinical studies. Also, other brands contain essential natural ingredients such as marsula oil and pea sprouts. This product seems to lack these key aspects and it may result in a less effective product. The manufacturer provides written instructions as well as an instructional video for customers to see how the product should be applied. The product is designed with a flock tip applicator that will help to comfortably reach small areas between the lashes and into the lash line. It is best to use the product in the morning and the evening after skincare. Customers can purchase Shiseido Full Lash Serum directly from the manufacturer’s website. A single tube of 0.21 ounces will cost a total of $35.00. This is a reasonable price, however, there are no discounts or cost effective bundle deals made available. The manufacturer does offer free shipping with orders $25.00 or more. Also, you may choose three free complimentary samples of any of the manufacturer’s products, with each order you make. The manufacturer offers a 30-day money-back guarantee on all items. This return time is quit short and in addition to this, they do not state the condition the product must be in upon returning it. This may leave you at risk if you return a partially used product. The customer reviews, found on the official website, present mixed feelings towards the product. After our review of Shiseido Full Lash Serum, we are happy to mention that we like the usage instructions provided for each customer. This ensures you know exactly when and how to use the product. Unfortunately, the review has also highlighted a few negative aspects that we need to address. We find it rather disappointing that the product fails to contain the key natural ingredients and patented ingredients that an eyelash and brow serum should contain. This may leave the product behind other brands that do contain these. Furthermore, customers are not given discount or provided with affordable package deals. Lastly, the money-back guarantee seems to be weak and the customer reviews are somewhat in decisive whether the product works or not. In conclusion, Shiseido Full Lash Serum does not seem to be an effective solution and we do not recommend it.